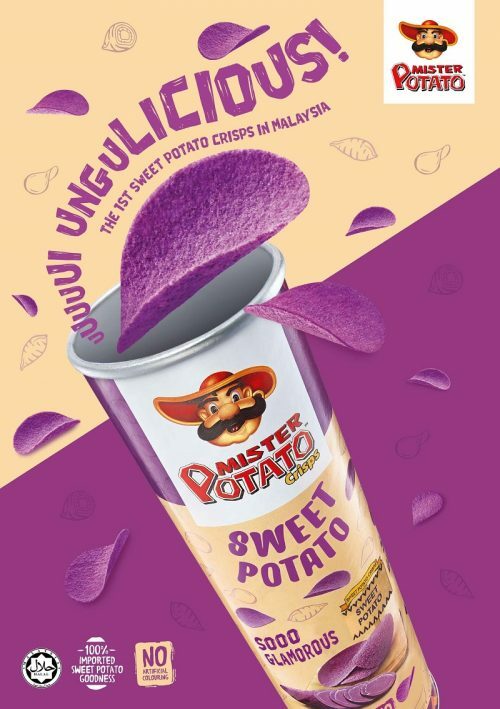 Mamee Double-Decker is betting on better-for-you crisps with the introduction of Mister Potato Sweet Potato in Malaysia. This follows the product’s earlier launch in Thailand in September 2016. In Thailand, the Mister Potato Sweet Potato in 100g is priced at THB 55 (USD 1.58), while a 45g size is sold at THB 25. Mister Potato Sweet Potato is available at 7-Eleven, FamilyMart, Lawson and Tops in the form of on-the-go canister. 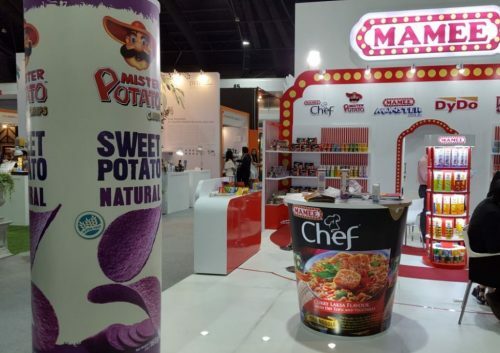 Mister Potato Sweet Potato was highlighted at Thaifex 2016 in the form of a giant canister. Image above was taken by the author. Thaifex 2016 was held in Bangkok on 25-29 May 2016. Mamee will also be showcasing Mister Potato Sweet Potato during the upcoming SIAL Paris on 16-20 October 2016. 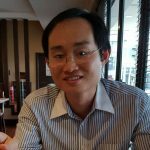 Exhibiting Mister Potato Sweet Potato at international trade events shows Mamee is betting big on the new sweet potato crisps to ride the global healthy snacking trend. 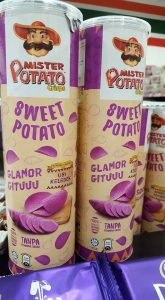 The Mister Potato Sweet Potato is available at 7-Eleven at a price of RM 6.30 (USD 1.50), the same price as the other Mister Potato range made from potato. The sweet potato crisp is manufactured in Malaysia. The key ingredients are purple sweet potato powder, dehydrated potato flakes and tapioca starch. Tong Garden’s NOI range is the closest competitor but it is in the form of a stick in pouch and not in a canister. Mamee Daebak Ghost Pepper is insanely spicy! !